Thanks to the hard working nose of a drug-sniffing working dog, hundreds of pounds dangerous fentanyl are now out of the hands of drug dealers near the port of Philadelphia. According to the U.S Customs and Border Protection, the fentanyl had a street of nearly $2 million dollars. The shipment was hidden inside barrels of iron oxide on a ship in route from China. It was shipped to the Area Port of Philadelphia and was discovered during a routine check. Within the check, 50 packages were found to contain sealed bags of an unknown white powdery substance, which where then tested and found to be fentanyl. The substance was tested using a handheld elemental isotype analysis tool that can identify over 14,000 chemical substances with the use of a laser or infrared beam to determine the substance was fentanyl. Drug sniffing dogs are usually at dangerous risk of accidental overdoses due to the small amount needed to throw off a dog’s fragile nervous system. Casey Durst, Customs Border Patrol Director of Field Operations in Baltimore spoke out on the growing scourge of public health issues relating to illicit drugs. 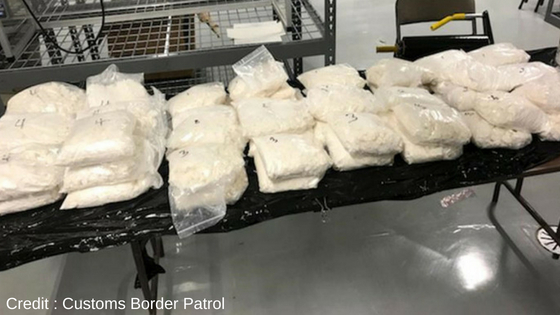 ‘Customs and Border Protection remains committed to keeping our communities safe by combatting the flow of illicit drugs, including synthetic opioids, into the United States,’ Durst said. Only recently did the CBP begin tracking drug shipments into the country, beginning in 2016, and fentanyl seizures are only increasing. In the first year, the CBP seized 440 pounds nationally. The next year increased to 951 pounds and up until April of 2018, 984 pounds have already been brought in, with no signs of slowing down. Fentanyl is being mixed with every drug imaginable, and in the last 10 days alone, The Philadelphia Inquirer reported that 20 crack cocaine users had overdosed. After unknowingly consuming the drugs that were laced with fentanyl. Does the Government have the Right to Limit a Doctor’s Ability to Treat it’s Patients?